Enjoy Coromandel's BEST at the water's edge. 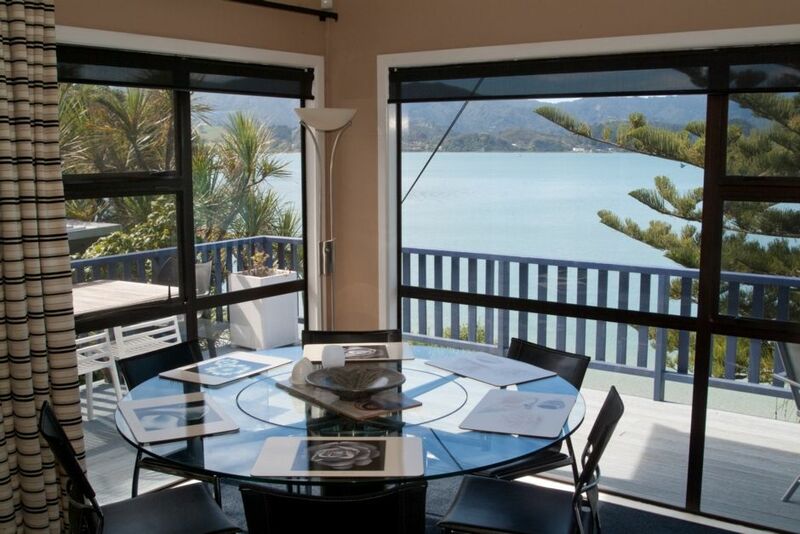 Situated in protected Coromandel Harbour this select property will take your breath away! Modern, 2 bedrooms, fully self-contained, well appointed with quality chattels, bed linen and towels. FREE WIFI INTERNET, an entertainer's kitchen, full laundry facilities all just 5.8kms from Historic Coromandel Township. Outside Gas BBQ and furniture on the deck, good parking for cars and boats, absolute beach front access with boat ramp close by. Flat screen TV with Freeview and DVD, stereo, and a small library of books, magazines, games, Cds and DVDs are provided for your enjoyment. Stunning harbour and beach views, the absolute beach front access is very safe for children. Watch them swim from the deck. Excellent for kyaking, fishing, bush walking or just relaxing...... golfing and horse riding nearby or visit the many shops, cafes, restaurants and the Arts and Craft scene in the Historic Township. Summer and Winter magic is garanteed. Modern thermostatic remote controlled gas heating with natural flame for that extra atmosphere and electric blankets for the winter months ensure your warmth and comfort. ESCAPE the city noise and come over on the AUCKLAND FERRY SERVICE. Our new taxi company Coromandel Cabs has been wonderful for visitors requiring transportation. This property is exceptional all year round. Minimum 2 night stay or single night stay surcharge $65. Advertised tariff is for 2 adults, with extra people $30 per night per person. If this unit is booked inquire about the Beachfront lower unit. Coromandel 9 Hole golf course - 5 km drive. Great location. Very comfortable. Friendly and helpful agent. Clean and spacious with wonderful views. Home away from Home right by the beach! Great service and lovely clean apartment with everything that you would need for a hassle free relaxing break away from the city life. Thank you Diane, you will see us again!